See that bottle up there? The 2007 Campo Viejo Rioja Crianza? Well, they don't make it anymore. Okay, technically they just changed the labeling. Apparently the word Crianza scared buyers away (I can hear Fran Drescher's voice saying, "I don't want CRIANZA"), even though Crianza just means a wine produced in Spain that has been aged for a minimum of one year. The Campo Viejo Rioja Crianza has always been Tempranillo (Well, Tempranillo-based anyway), but now they just label it Tempranillo. Apparently it sells better that way. I'll figure there's still some of these bottles around since they just changed the labeling this year, so that's where my review comes in handy! 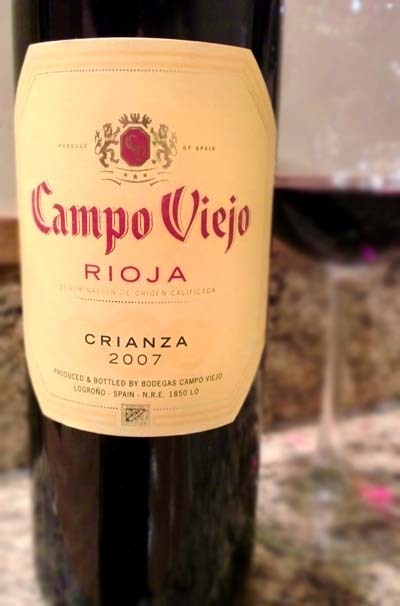 The 2007 Campo Viejo Rioja Crianza pours a deep ruby color that does let some pink/purple light through. It has aromas of sweet red cherries, raspberries, leather, and a touch of spice. It tastes of semi-dry ripe red berries, cranberries, vanilla, fennel, hints of tobacco, and a fair bit of oak followed by a strong tannic finish. For the $10 price tag, it's a great deal. I'm not going to say it's the best Tempranillo I've ever had, but it's definitely good at this price point. Find a bottle before they're all gone! I'm hoping the newer Campo Viejo Rioja Tempranillos are as tasty. Drink This: if you want a good Tempranillo for the price. Don't Drink This: if you can't find it. Like I said, I hope the newer vintages are equally as good.